This product is now obsolete. Please click here for the latest Kane product range. The Kane CO91 is shaped just like a standard digital multimeter. The Kane CO91 is very easy to use and it's core ability is to measure both ambient CO levels and the level of CO concentration within flue gas. The Kane CO91 features an internal pump, giving it an instant response. The CO levels are recognised straight away and the overall CO levels can be measured from 0-2000ppm. The Kane CO91 measures not only single measurements, but it also is able to detect the MAX value over an amount of time, which gives the user the capability to work out the highest CO level detected. 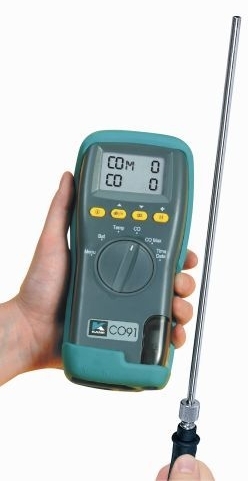 With the use of a flue probe, the Kane CO91 can also measure temperature between 0 and 600°C. CO measurements and temperature measurements can be printed out using a Kane printer (sold separately). The Kane CO91 also features an auto-zeroing procedure when powered on.